Twitter has a Nazi problem. You know this. I know this. We all know this. But for some reason, I remain consistently shocked by the blatant anti-Semitism on the platform. Back in October 2016, when we were all about 400 years younger, The New Yorker published an article on “Twitter’s Anti-Semitism Problem,” where Ryan Lizza writes that the company has a reputation “as the platform with the most laissez-faire attitude toward hate speech.” Twitter notoriously is terrible at dealing with Nazis (see: Why Can’t I Stop Reporting Anti-Semitic Trolls on Twitter?) even though they verified @antisemitism! While anti-Semitic tweets tended to spike in the wake of election-related news coverage, the language used in the anti-Semitic tweets was not solely election-related. Many tweets referenced classic anti-Semitic tropes (Jews control the media, Jews control global finance, Jews perpetrated 9/11, etc.). This suggests that while the initial provocation for anti-Semitic tweets may have been at least nominally election-related, the Twitter users generating targeted anti-Semitism may have used news events as an excuse to unleash anti-Semitic memes, harassment, etc. So, let’s talk about those tweets not directed at journalists, but just users shouting into the void with their anti-Semitic conspiracy theory! 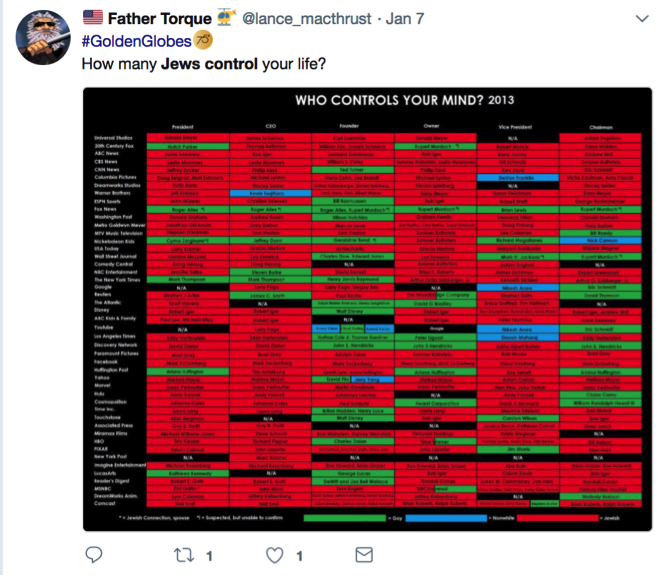 “Jews control [fill in the blank].” I searched it on Twitter and narrowed my results to just tweets from 2018. Just in 2018, what do Twitter users believe Jews control? And this is only in the last two weeks! I’m wary to give these tweets attention. Buuuut…let’s have fun with it! We’ll start simple with @bappy608. Really drove his point home with the double use of “Jews.” Both a hashtag and a capital JEWS. Further investigating @bappy608’s profile lets me know that he is “16. Wisconsin. Martial Artist. Far Alt-Right Trump Supporter. White Advocate.” Sound like a reaaaaaal fun dude. Another Jews-control-the-media. It’s truly a classic. @zylx5374 point out that not only do Jews control the media (or “media influence,” unsure the difference. @zylx5374, please clarify!! ), but they hate American nationalism, and that Michael Wolff is a Jew. Cool! A wade into international politics — @PMahumapelo has over 2,000 followers — because Jews apparently control the South African banks. But not just the banks; the Jews are the fake news. Gasp! @Mike88summer was apparently trying to convince our president that Afghanistan was not an issue, but Israel. Because, you know, 9/11. Oh and that Jews are running the media. There’s another subset of “Jews control” tweets that feature infographics. They confuse me more than enlighten me. Take @lance_macthrust’s graphic that he tweeted during the Golden Globes. Sadly outdated; the image header says it’s from 2013 — update your data, Lance! — but it shows all the Jews in positions of leadership across the media. The only organization with no Jews: Fox News. Sad! 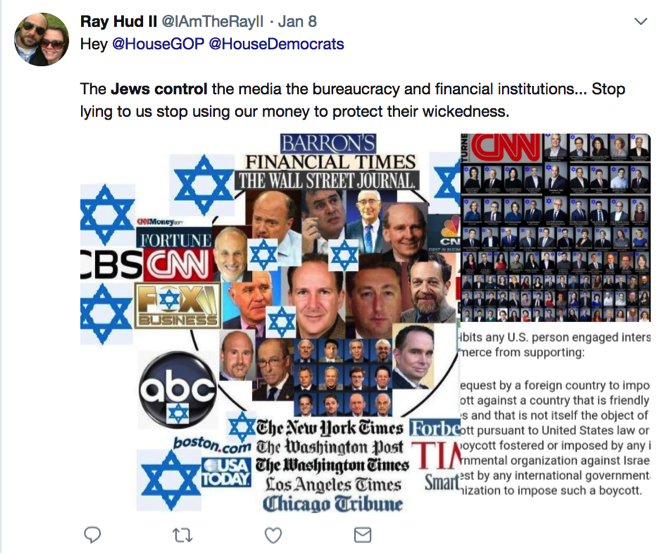 In another graphic, @IAmTheRayII tweets at both the House Republicans and Democrats that the Jews are controlling the American media, bureaucracy, and financial institutions. He presents us (by us, I mean his staggering 1,279 followers. How does @IAmTheRayII have more followers than me?) with confusing images: a collage of stars of David, news media companies, and Jewish men and a graphic of CNN with stars of David. All I’m getting is hella anti-Semitism.